The Side Door Poets Critique Group is held in Midtown Atlanta. . It is currently full, as is the waiting list. For advice on starting a satellite group or for other information contact Karen Paul Holmes at kpaulholmes@gmail.com . Brick Road Poetry Posse meets every third Thursday of the month at 513 Broadway, Columbus, GA (in the historic district). Poets are invited to a poetry writing workshop. Dessert and coffee are provided. Participants give each other feedback with the goal of improving their poems. The workshop is led by published poets. All styles of poetry are welcome. Please bring copies of your poem to share. This event is Free! Sponsored by the Georgia Poetry Society. For information contact Ron Self at 706.221.4370. Johns Creek Poetry Group meets for open mic/featured poet/critiquing of each other’s poems at the Northeast Regional Library 9560 Spruill Rd., Johns Creek, GA 30022 from 10:15 a.m. until 12:00 p.m. the first Saturday of each month. For more information contact the leaders (Kathy Ellis, Donna Mulcahey, or Steven Shields) at Johnscreekpoetry@gmail.com. Poetpourri meets twice a month on varying Fridays 1:30 – 3:30 p.m. at the Oconee County Library, Watkinsville, GA 30677. For more information contact Elizabeth Howells at beetle_7@hotmail.com . The Poetry Matters Project meets at the Hire Grounds Café in Augusta, GA, monthly for open mic and readings. Contact Lucinda Clark at poetrymattersproject@gmail.com or at https://www.facebook.com/poetrymattersproject/ . Southwest Atlanta Open Mic is hosted by GPS member Ira Harrison with a poetry open mic every first Tuesday of the month at 6:00 p.m. at the Southwest Branch of the Atlanta-Fulton Public Library, 3665 Cascade Rd. SW, Atlanta, GA 30331. Telephone: 404.699.6364. Web: afpls.org. If you would like your workshop listed here, please send details to Ann Gillespie, ret2teach@windstream.net A GPS member must be part of the leadership of any group appearing in our listing. Please also report to us any broken links or inactive workshops so that we can keep our list up-to-date. 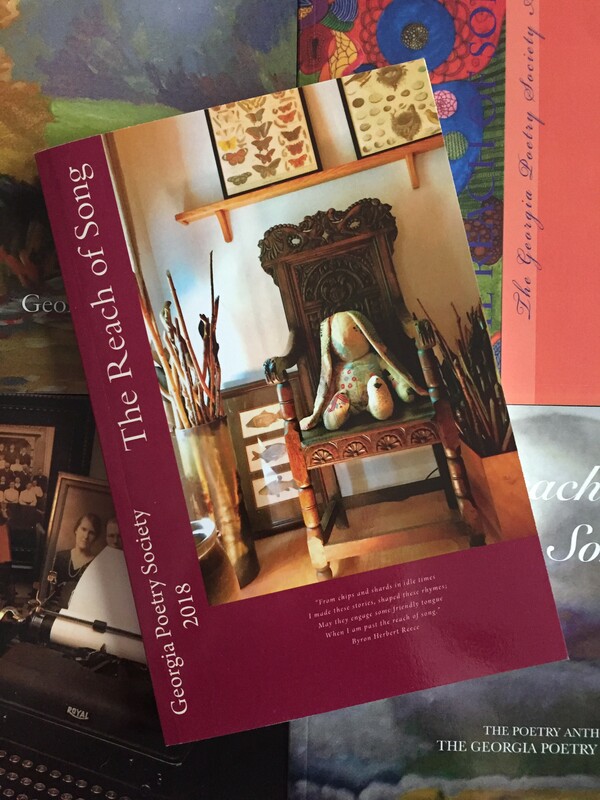 Reach of Song Anthology today!